Top U.S. officials in Afghanistan on Sunday condemned the burning of a Quran in the United States that sparked three days of protests in which more than 20 people died. Burning the Muslim holy book "was hateful, it was intolerant and it was extremely disrespectful and again, we condemn it in the strongest manner possible," said Gen. David Petraeus, who heads the U.S.-led international forces in Afghanistan. U.S. Ambassador Karl Eikenberry said in a statement that Americans respect the Quran "and all religious texts and deplore any action that shows disrespect to any religious faith." "At the same time, I want to emphasize, as have many Afghan leaders, that to attack and kill innocent people in response to the deplorable act of one individual is outrageous, and an affront to human decency and dignity," Eikenbery's statement said. 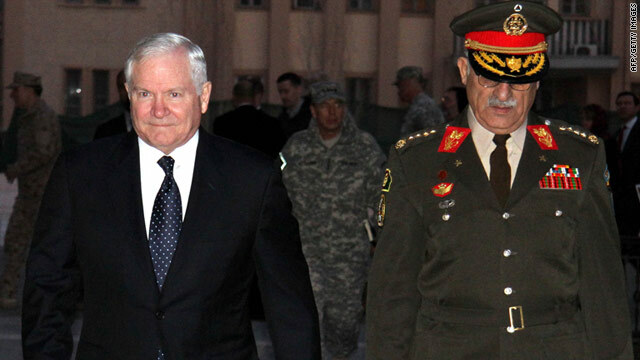 US Defence Secretary Robert Gates is escorted by Afghan Chief of Staff Lt. General Shir Mohammad Karimi. U.S. Defense Secretary Robert Gates arrived in Helmand province in southern Afghanistan Tuesday morning as he continued his two-day trip to the country, meeting with senior officers and Afghan leaders. Gates' visit is his 13th to Afghanistan since he became defense secretary in 2006. He last traveled to the embattled country three months ago, in December 2010. He has said he prefers to make quarterly tours to monitor the war effort, according to Pentagon Press Secretary Geoff Morrell. On Monday, Gates offered his personal apology to Afghanistan President Hamid Karzai for the killings of nine Afghan boys last week in a NATO-led helicopter attack targeting insurgents, saying the incident "breaks our hearts." Two civilians were hurt when indirect fire hit Bagram Airfield in Afghanistan on Thursday, the International Security Assistance Force said. Three rounds of fire struck the base, the force said. The civilians who were hurt were treated and released. Officials said they do not know what type of rounds were used, although insurgents in the past have fired rockets. Bagram is a heavily fortified base, its perimeter guarded by high fences and thick, concrete walls. The last time the airfield came under indirect fire was on October 22. Prior to that, it was struck on September 11. In both instances, officials believe rockets were used.